On Friday 5 October, animal welfare charity Viva! 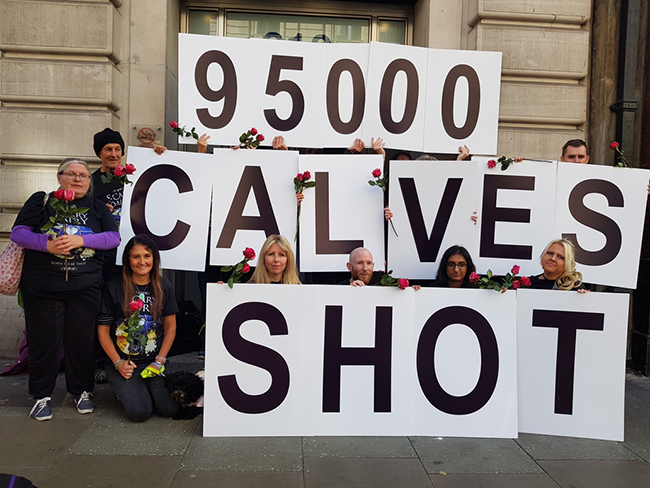 kicked off their nationwide TRASH campaign tour by holding a demonstration outside Dairy UK’s head office. Vegan charity Viva! will be holding eight street action events from Glasgow to London as part of their TRASH campaign. 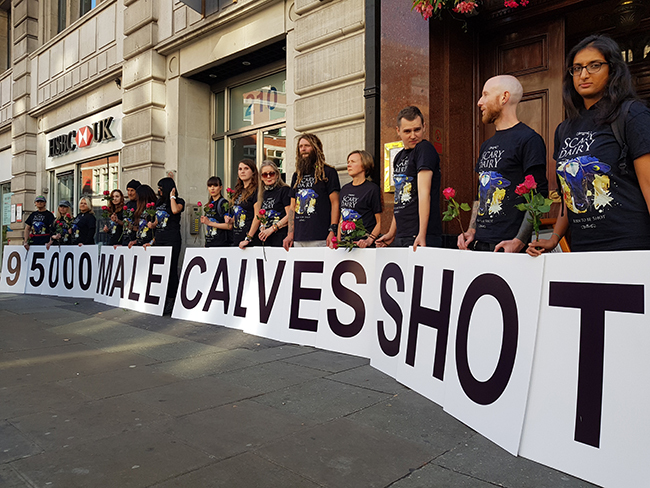 The campaign aims to raise awareness of the forgotten victims of the dairy industry – male calves – and forms just one part of their ongoing campaign to highlight the dark side of dairy. The tour launched outside the Dairy UK Head Office in Holborn, London. In collaboration with local activist group Croydon Vegan Outreach, Viva! will hold a peaceful demonstration to encourage the public to watch their undercover investigation exposing the dairy industry. From there, the activist group moved to Leicester Square, London and continued their street action event. 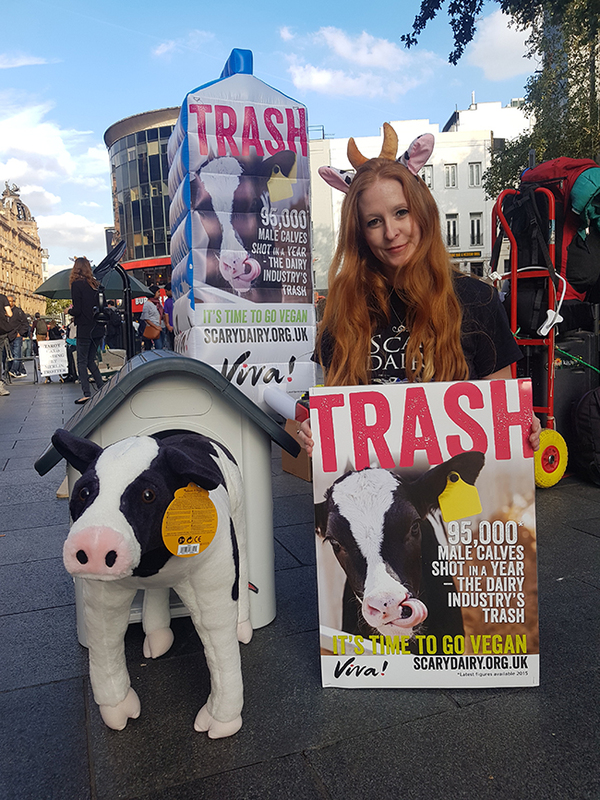 The street action events aim to promote positive discussions about veganism and feature an 8-foot-tall inflatable milk carton covered with facts about dairy. In recent years, the UK has seen a steady decline in the demand for animal-based products whilst sales of plant-based products continue to grow . Yet many people are still unaware of the barbaric dairy farming practices that are standard in the UK. Dairy cows produce milk for the best part of a year and then stop. To continue producing milk for human consumption, they are kept in a perpetual cycle of forced pregnancy and birth. Female cows are artificially inseminated and their calves are taken away shortly after birth. Around two million dairy calves are born in the UK each year. Male calves are a ‘useless by-product’ of the dairy industry, which means tens of thousands a year are shot shortly after birth or sold to the veal and beef industry. Female calves face the same fate as their mothers – near-constant pregnancy until they collapse from exhaustion and are killed for ‘low grade beef’ at around five years of age. “Many people never see the darker side of the dairy industry. Dairy cows carry their babies for nine months – just like humans – but then have their calves taken away from them just hours after birth. Male calves are considered a useless by-product and so are brutally shot in the head. It is so important that we share this information with the public and give them the opportunity to learn the truth behind the dairy industry.